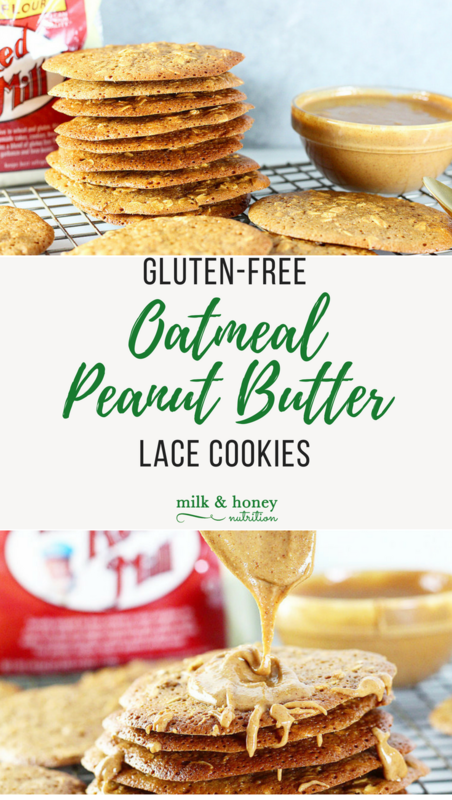 These Gluten Free Oatmeal Peanut Butter Lace Cookies were a staple in our house growing up (the non-gluten free version that is). And once I got to an age where I could make them myself, they were a request of all my friends in high school and college! Fast forward 10 years later when my husband was diagnosed with celiac disease, and I was determined to come up with a gluten free version he could enjoy! They're great for summer as a fun light treat after dinner, or even better crumbled up on top of ice cream! Pre-heat your oven to 325 degrees. Line baking sheets with foil. Combine the coconut sugar, gluten free flour blend, baking powder and salt in the bowl of a stand mixer. Mix briefly to combine. Add the remaining ingredients (except the oats) and mix for 60 seconds. Remove the bowl from the mixer and mix in the oats by hand. Store the cookies in a sealed container on the counter for up to three days. Enjoy!